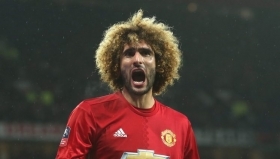 Manchester United have confirmed the departure of midfielder Marouane Fellaini to Chinese Super League side Shandong Luneng on a permanent basis. The Belgian's future had become a discussion point after the departure of manager Jose Mourinho last month with interim boss Ole Gunnar Solskjaer reluctant to offer him with regular gametime. This has eventually contributed to the midfielder's pursuing a fresh challenge in the Far East and United have now officially made a statement regarding the same. "Manchester United can confirm that Marouane Fellaini has left the club on a permanent transfer. Everybody at United wishes him well for the future as he completes his move to Shandong Luneng Taishan FC in China." a statement read on their official website. Meanwhile, the clearout at United may continue at the end of the campaign with Matteo Darmian, Antonio Valencia and Marcos Rojo among those, who are likely to be shown the exit door irrespective of who manages the club by then.